Nothing turns more heads than the word “free.” Consumers love getting something they want or need for free, which is why weather-based retail promotions are so popular. A weather-based promotion is when you offer a full or partial refund on a purchase based on the occurrence of a specific weather event. For example, if it rains one inch on July 4, all purchases made during the promotion are free. 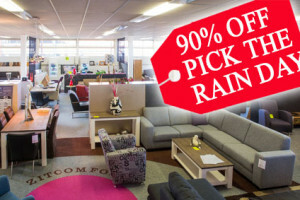 Weather-based promotions are a fun and unique way to attract more customers to your store, generate press coverage, improve customer loyalty and — of course — increase sales. Are you thinking this type of promotion is too risky because you’re worried you might end up losing money? With promotion insurance from Spectrum, you can rest assured that you are protected from any unnecessary financial liability. Promotion insurance enables you to run weather-based promotions by covering refunds incurred should the specified weather event take place. So who are weather-based promotions for? A weather-based promotion works best for big-ticket items because the payback is greater. In addition to your return per sale being higher, getting a $5,000 refund is much more appealing to consumers than getting a $50 refund. Below we’ve compiled some of the most successful weather-based promotions that we can insure. Wedding season is almost upon us, which means now is when many couples will be investing in their wedding bands. Ensure they choose your store over your competitors’ with an attractive promotion they can’t pass up: the possibility for their purchase to be free! With a wedding day rain promotion, you can advertise that if it rains an inch or more on their wedding date, their wedding band set is free. This will surely attract more customers who — having likely already put enough money into their wedding at this point — will be enticed by the possibility to cut a huge expense and have some extra cash for their honeymoon. The great news for them is that the measurement is taken at your local airport, so it doesn’t even need to rain on their wedding for them to get a refund. A wedding day rain promotion could also work for other wedding-related retailers or vendors, such as wedding gown or menswear shops, event rentals and even photographers. Additionally, weather-based wedding promotions aren’t limited to summer. Our jewelry clients have also had great success running snow promotions during the winter holidays, when many people get engaged, in which engagement rings are free if snowfall exceeds a specified amount on Christmas, New Year’s Day or Valentine’s Day. Household appliances are another popular market for weather-based promotions, particularly for heaters during winter and air conditioners during summer. If your air conditioner has ever quit on you in the heat of summer, you understand the urgency of replacing it. The best way to quickly get the attention of these consumers is to offer the best deal. So how do you ensure your company is offering the best deal? You offer your air conditioners at an unbeatable price: free! Run a promotion where, if the temperature exceeds 100 degrees on Independence Day or Labor Day, for example, air conditioning units purchased during the promotion are free. This ensures your company stands out among your competitors, thus increasing your sales that month. And with weather promotion insurance from Spectrum, you won’t pay back a dime even if the temperature does reach over 100 degrees. Of course, these are just examples. From RV and boat promotions in the spring to snowmobile and snowblower promotions in the winter, we can create a weather-based promotion for just about any retailer and any weather event, and we’re happy to create a custom policy just for you. Contact us today to learn how we can help increase your sales!